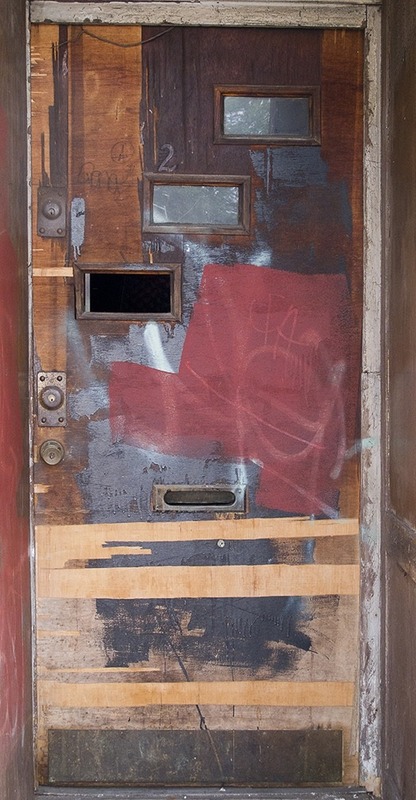 The photographs here come from a new book, Door Jams: Amazing Doors of New York City, by Allan Markman. 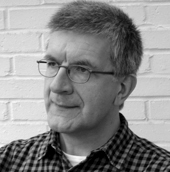 He was formerly senior graphic designer at the United Nations and his fascination began while working on a poster about ethics for which he spent four days photographing doors around Manhattan. The poster was never used, but Markman found himself compelled and he kept on going. The book is the fruit of six years of crisscrossing the city and boroughs of New York with his camera in search of remarkable doors. Door Jams (Schiffer Publishing) has all kinds of doors, and sometimes gates, from sleek metal entrances in midtown Manhattan to ebullient spraycan paintings in Brooklyn and Staten Island, to the grand sculpted portals of cemeteries in Queens and the Bronx. With more than 300 doors to show, at two or even three to a page, there had to be some method of organization and Markman has gathered similar doors together, butting the pictures up against each other in pairs and sometimes making a composite image of several doors, which runs without a break across the spread. 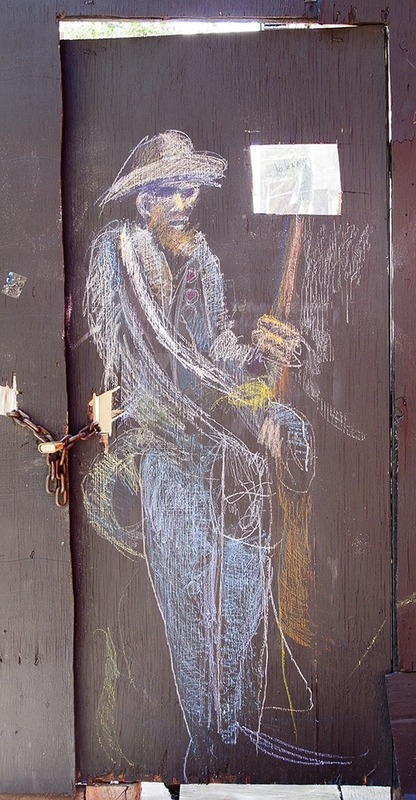 The linking theme might be style — doors with crosses, doors in arches, improvised doorways secured by padlocks and chains — or simply color; Markman has a good color sense. Sometimes the relationships between doors are looser and more intuitive, like a kind of visual music. These designerly “jams” are often highly effective, though the fusion of images does reduce the impact of individual shots. I like the photographs in their own right, so that’s how I’m showing them here. 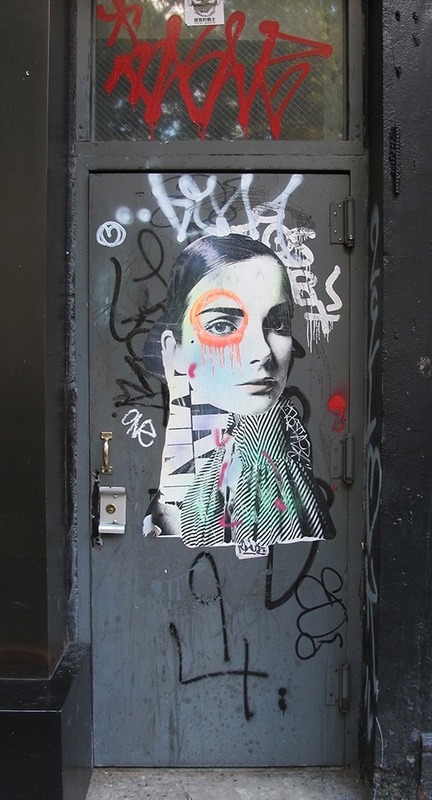 In the pictures that fascinate me most, the doorway becomes a kind of artwork by a combination of accident and design. This is the process I described in a recent post about the incidental pleasures of street art (I first heard that Door Jams was forthcoming when Markman wrote to me in response to that piece). The picture at the top, showing what appears to be a photograph of a bearded man, is a perfect example. It’s reasonable to speculate that the person who stuck up the picture intended it to be seen as art and perhaps also considered the painted background, the black, yellow and red stripes, to be key to the effect, which it is. Then, later, the face appears to have been blanked out with black paint, an operation carried out with some precision, presumably by a different person, who has also obscured a written element in the bottom righthand corner. 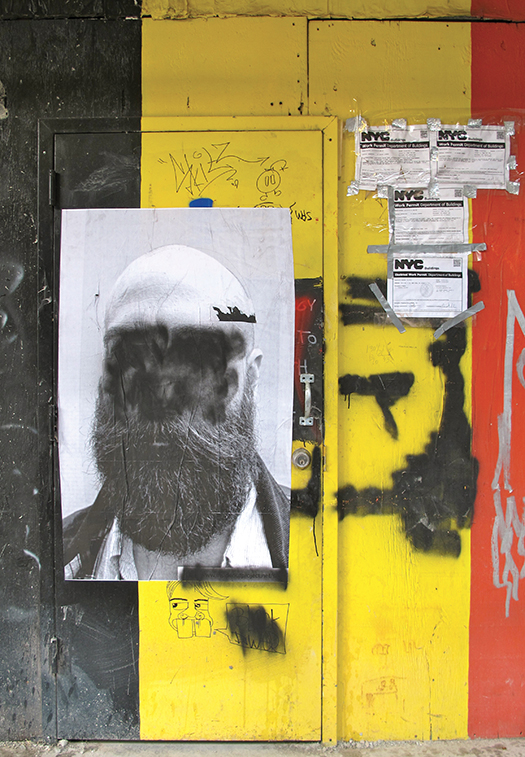 Who could say at what point the four official NYC notices secured by gray tape arrived, but they have also become an integral part of the composition, as Markman captures it here, in his own work of photographic art. It’s highly likely, if we were to locate the door now, somewhere in Manhattan’s East Village, that it would have changed again. It might even have become unrecognizable. Doors of this kind are constantly in flux. The rectangular surface, sitting in its frame, offers a ready-made picture space, a site for painting, spraying, stenciling, and improbable bursts of collage (a woman’s face, a bowl of fruit — see below) or drawing (a ghostly, dark-eyed cowboy etched in chalk). 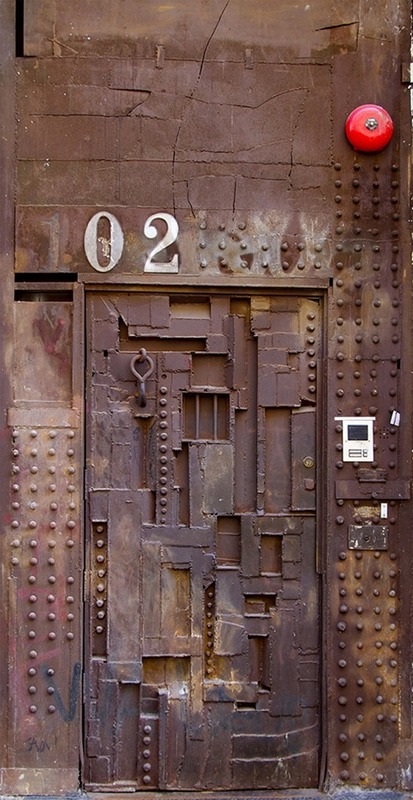 In one of Markman’s more extraordinary finds, a door has been remodeled as a Louise Nevelson-esque box-maze of blocks, recesses and rivets, like the threshold of an artist’s prison chamber. Doors like this seem to tell tales about hyperactively creative occupants or neighbors, who might be painters, sculptors, musicians or illustrators — it’s hard to imagine that designers would tolerate the mess. All doors leading to places that we don’t know about are mysterious. The locked entrance beyond which we cannot pass because we have no business inside is an invitation to speculate and imagine. This makes the barrier of the door or gateway, and the possibility that it might open to permit our entry, highly potent as a symbol. The portal represents the attraction and fear of the unknown. “At a psychological level, gates are found between the inner world and the outer, between sleeping and waking,” notes the entry on gates and doors in The Book of Symbols (2010). 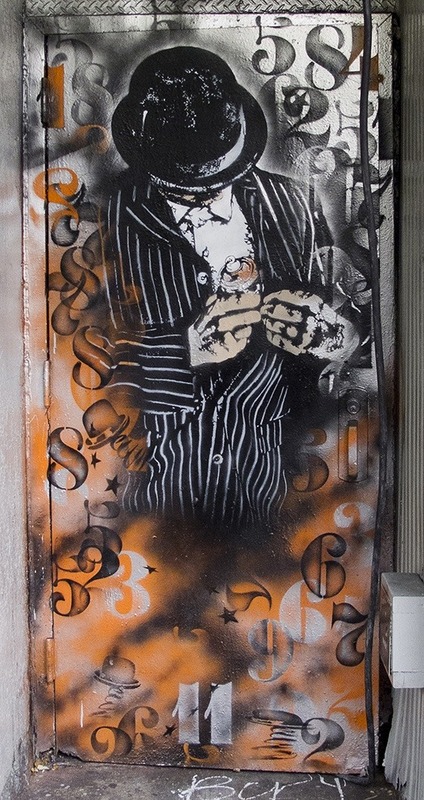 “So gates are places of transition from one state to another.” In these photographs, the evolving, enigmatic patchworks of marks and imagery that spread like fungus across the doors often seem to be emanations from the other side. I would say the less artful ‘tags’ that are quickly thrown up are necessary for the process and development of graffiti art as a visual language? And although these markings are sometimes misconstrued as vandalism or a nuisance, they are necessary because they provide the basis for more elaborate graffiti art? And furthermore, do you feel that legal walls encourage creativity, or extinguish the true spirit of this irreverent art form?